If I Could Ask God Anything is a uniquely kid-friendly book jam-packed with clear, fresh answers to important questions about God, faith, prayer and Christianity in language that children can understand. Using fun illustrations and kid-friendly language, established author Kathryn Slattery tackles "toughies" such as: "Does God stop loving me if I sin? "; "Why should I go to church? "; "How can the Holy Spirit help me? "; and more. Nurture a child's mind and spirit with this well-rounded, Scripture-based guide. If I Could Ask God Anything is a unique kid-friendly book jam-packed with clear, fresh answers to important questions about God, faith, prayer and Christianity in language that kids can understand. 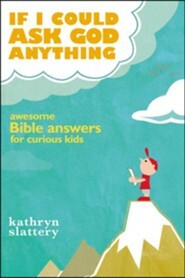 Established author and mom Kathryn Slattery tackles "toughies" such as: "If God is invisible, how can I know He is real?" "Does God stop loving me when I sin?" "Why should I go to church?" "When I die, is it true that I become an angel with a halo and wings? 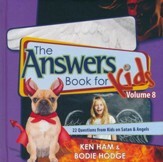 "&hellip; As well as fun, real-life questions from kids such as: "Does God ever sleep?" "Did Jesus live on Earth before or after the dinosaurs?" "Is it OK to pray for help on a test?" Written for children of all denominations, this biblically-based book includes fun illustrations and helps kids understand and articulate what they believe and why they believe it. It reassures young hearts that God cares for them and loves them very much! Most importantly, it encourages children to embrace a deep and lasting personal relationship with a living, loving God through faith in Jesus Christ. Nurture a child's mind and spirit with this well-rounded, comprehensive, Scripture-based guide. And who knows, maybe you'll answer some of your own stumpers along the way! "The writer really knows her Bible&hellip; A great resource for all of us Sunday school teachers with classrooms of kids!" "I'm pleased to have [this book] as part of our Library&hellip; it will be a great blessing for the children&hellip;"
"&hellip;Answers to kids' questions about God are clear, thoughtful, and theologically right on." "A treasure of a book! Answers are clear, reassuring&hellip; A copy is going to each of our grandchildren!" "&hellip; An enormous help and encouragement to Christian parents&hellip; It will help them with their children's most challenging questions about God." Kathryn Slattery is a long-time Contributing Editor for Guideposts magazine, for which she has written hundreds of stories of faith and inspiration. She is the author of If I Could Ask God Anything, Grandma I'll Miss You, The Gospel for Kids, The Grace to Grow, and A Bright-Shining Place. Her writing has also appeared in numerous "best of" Guideposts anthologies, and Today's Christian Woman. She resides in Connecticut with her husband, Tom, where they are the parents of two adult children and happy owners of a roly-poly pug named Max. Known by millions as a longtime Contributing Editor for Guideposts magazine, Kathryn "Kitty" Slattery has written hundreds of stories of hope and inspiration for a wide variety of publications, including ParentLife, Todays Christian Woman, and Angels on Earth magazines. In addition to her latest childrens book, 365 Bible Answers for Curious Kids: An "If I Could Ask God Anything" Devotional (Thomas Nelson), she is the author of My Friend Jesus (Thomas Nelson), If I Could Ask God Anything: Awesome Bible Answers for Curious Kids (Thomas Nelson), Heart Songs: A Family Treasury of True Stories of Hope and Inspiration (Guideposts Inspiring Voices), the memoir Lost & Found: One Daughters Story of Amazing Grace (Guideposts Books), Grandma Ill Miss You: A Childs Story about Death and New Life (David C. Cook), The Grace To Grow: The Power of Christian Faith in Emotional Healing, A Bright-Shining Place: the Story of a Miracle, and she is a contributing author to numerous Guideposts anthologies, and TommyNelson.com. Her childrens book The Gospel for Kids (David C. Cook) has more than 100,000 copies in print in nine languages. Kathryn, who is known as "Kitty," resides New Hampshire with her husband Tom, and they are the parents of two grown children. Visit Kitty and learn more about her work at her website: www.KathrynSlattery.com, and her Facebook Author Page: Kathryn "Kitty" Slattery. I'm the author/artist and I want to review If I Could Ask God Anything: Awesome Bible Answers for Curious Kids - eBook.